This will be a very brief piece as the days get busier and busier before Friday and we start with our first event at Waterstones – if you are in the Canterbury book shop in Rose Lane at about 11am do feel free to come along to the children’s section to meet Saturn the green dragon, he will be looking for helpers, both young and old. Yesterday was partly spent going around two of the locations for the guided tours on Saturday morning undertaking the necessary risk assessments. The other two sites have already been done but I met Mick Wright from Security at the King’s School and later in the day Euan Maybank from the Marlowe Theatre Trust. It is a long time since I have been round the Black Friars buildings, and it was especially interesting to see what King’s has done in terms of adapting the old guest hall for its new use as offices, I think, and an exam hall. The old refectory has been in King’s hands far longer and it is the school’s art and craft studio. 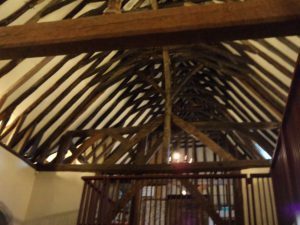 Roof in the Black Friars’ refectory. The Poor Priests’ Hospital has also changed function since the last time I was there. 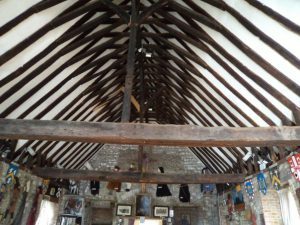 For until late last summer it was the Canterbury Heritage Museum, and some of you may remember the attempt to keep it as a museum, albeit one that was due for renovation because little had been spent there on updating showing off the collection for several decades. However, this did not happen and instead the Marlowe Theatre Trust is now the building’s custodian. Consequently, when Professor Paul Bennett (Director of Canterbury Archaeological Trust) and I met Euan Maybank from the Marlowe on Tuesday to go around the building – Paul is leading the guided tour on Saturday respecting ‘how to read a stone building’, we saw that many of the artefacts in the collections have been moved, some to the Beaney but it is not clear where other pieces have gone. However, the fabulous collection of maser bowls, some from the early 14th century, are still in their display cabinet in the solar, which is good because they are great treasures and belong to the city’s and probably the country’s earliest hospitals, St John’s at Northgate and St Nicholas’ at Harbledown, the Lanfranc hospitals dating from the early 1080s. 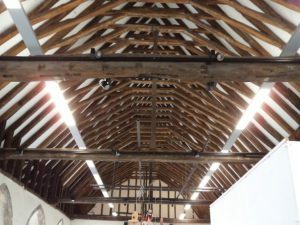 Roof in the Black Friars’ guest hall. The building remains a fabulous example of a medieval hospital, and there are also little fragments that point to its later use, such as traces of blue paint used in that part of the building which housed the Blue Coat school, a city charitable institution for poor orphans who were give some schooling and apprenticed to make them good, useful members of society. Yet it is its function as a hospital that personally I find so interesting, especially the way the hall was re-orientated 180 degrees, the high end becoming the low end and vice versa. Black Friars’ refectory across the river. Then today Diane Heath and I had the chance to attend a rehearsal of the ‘Campfire Tales with a Canterbury Twist’ that took place in the garden behind The Canterbury Tales. Russell is our story-teller and he has been working on giving Chaucer’s Tales a great immediacy for a local audience. 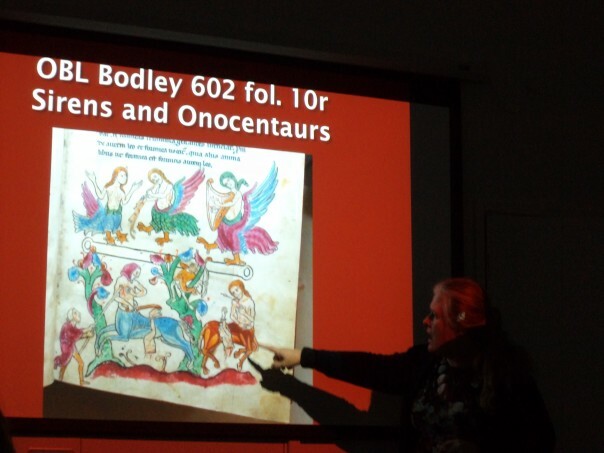 As a follower in the great tradition of medieval story-telling, Russell was keen to bring in audience participation, and his fellows at The Canterbury Tales were more than prepared to join in. Interestingly, he has given himself the character of a yeoman, who is a mentioned in conjunction with the knight and squire, being part of their company. However, he isn’t portrayed as a wealth man, nor does Chaucer give him a Tale, but his presence suggests something of the instability felt across late 14th century society, where social climbing was frowned upon but could not stop those taking advantage of the reversal in the previous (pre-Black Death) balance between labour and land, wages and prices. I won’t spoil the surprise by saying which of Chaucer’s Tales he used but it was great to see how he employed them as his basic structure and then set himself the creative task of using what was thrown at him – not literally, but ideas by the audience – to develop the Tale and keep it on track so that those who know their Chaucer would follow what he was doing. 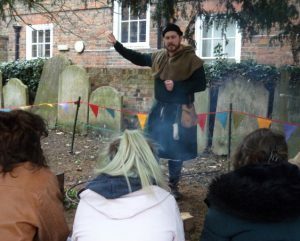 This seems an excellent idea for a mixed audience of children and adults and it will be exciting to hear what his audience propose for his story-telling on Friday between 3 and 4pm as part of the Medieval Canterbury Weekend. Tickets will be available for purchase just beforehand at the garden. 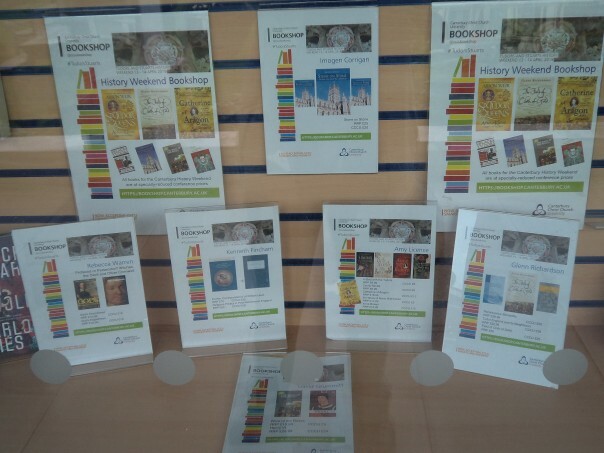 Thus, things seem to be moving forward on course for the opening events on Friday and if you are still undecided, do please check out the website for details and come and meet historians such as Helen Castor, Janina Ramirez, David Starkey, Stephen Church, Carenza Lewis and many more. 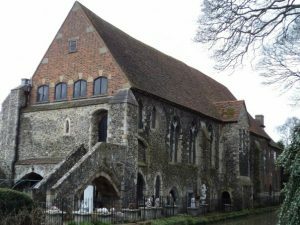 Tomorrow is the last day for ticket sales from https://www.canterbury.ac.uk/medieval-canterbury and from Friday evening onwards tickets can be booked (cash sales only) at the temporary box office in Old Sessions House at CCCU where most of the events will be taking place.